Key Difference: Niagara Falls are the waterfalls located on the Niagara River. They comprise of three waterfalls: The American Falls and Bridal Veil located in the United States of America and the ‘Horseshoe’ Falls that are geographically located on the Canadian side of the border. Thus, there is no difference between Niagara Falls NY (USA) and Niagara Falls Canada in context to waterfalls. However, Niagara Falls (U.S.A.) may be used to refer to the American Falls and Bridal Veil, whereas Niagara Falls, Canada may be used for the Horseshoe Falls. Niagara Falls is also the name of two cities, one is situated in the U.S.A. and the other is situated in the Canada. Niagara Falls consists of three separate waterfalls. Two of the waterfalls are situated in the United States and one is located in Canada (American falls, Bridal Veil Falls and the Canadian Horseshoe falls). The Bridal Veil is the smallest among them. American Falls and the Bridal Veil Falls are separated by a small piece of land called Luna Island. These Falls were formed due to the melting of glaciers. The rushing waters carved out a river in their descent and at one location passed over a steep cliff type structure. Man-made attractions of Niagara Falls include Maid of the Mist, Table Rock Scenic Tunnels, Spanish Aero Car, Ripley's Believe it or Not Museum, Marine land, Casino Niagara, IMAX Theatre, and the new Butterfly Conservatory. Niagara Falls may also refer to a name of a city. 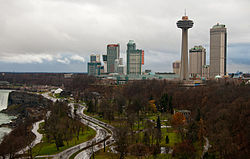 One of the city named as Niagara Falls is situated in the Niagara County, New York. Similarly, a city named as Niagara Falls in also present on the Niagara River in the Golden Horseshoe region of Southern Ontario, Canada. Niagara Falls, Ontario is just 130 kilometers away from Toronto by road. A humid continental type of climate is experienced in the city. The hydroelectric power, that is generated by the waterfalls, paved the path for many electro-chemical and electro-metallurgical industries that started emerging in early to mid-20th century. Niagara Falls, U.S.A. has also flourished due to cheap and an enormous source of power. The city was legally formed on March 17, 1892 from the villages of Manchester and Suspension Bridge, which were parts of the Town of Niagara. Iroquois Indian word “Onguiaahra” meaning “The Strait”. Horseshoe Falls is a part of Niagara falls in Ontario, Canada. The American Falls and Bridal Veil have a total crest line of about 1,100 ft. Horseshoe Falls has a crest line of about 2,200 ft. The American Falls and Bridal Veil in the United States of America and the ‘Horseshoe’ Falls in Canada. A city on the Niagara river in Southern Ontario, Canada.